Participating Artists: Jack Anderson, Allyson Block, Ron Brown, Jim Buchanan, Charles Caldwell, Jeanette Centeno, CJ Collins, Tammy DeVoe, Maria Dominguez, Bob Freese, Evelyn Graves, Micha Hamilton, Julien Hryshko, Al Johnson, Angela Kariotis, Sue Karnet, George Kopp, Abby Levine, Julie Levine, Beatrice Mady, Alan McCormick, Larry McKim, Mansa Mussa, Nancy Nikkal, Sam Parr, Melida Rodas, Felix Sockwell, Debra Wade, Joe Walentini, Alan Walker, Michael Weintrob, Gail Winbury and Ann Vollum. Exhibition celebrates New Jersey’s rich history and central role in the evolution of the musical genre, and features artists who have been inspired by its innovations and stylings. August 20, 2013, SOUTH ORANGE, N.J. – Through the use of audio recordings, video presentations, photography and other visual art, the exhibition JAZZ STORIES strives to explore the cultural connectedness and influence of Jazz music in a variety of contexts and ranges: as an examination of order and chaos, as an indicator of time and place, as a conveyance of the voice in storytelling, and as an expression of pure emotion. 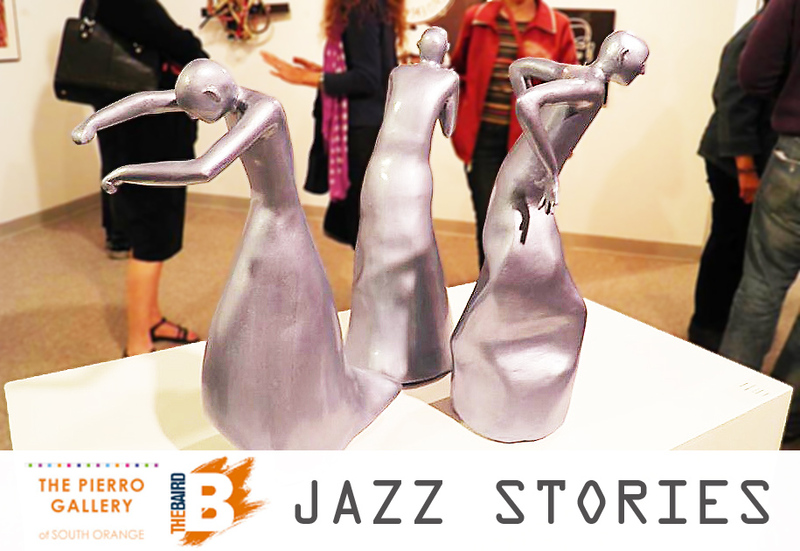 JAZZ STORIES features artists Jack Anderson, Allyson Block, Ron Brown, Jim Buchanan, Charles Caldwell, Jeanette Centeno, CJ Collins, Tammy DeVoe, Maria Dominguez, Bob Freese, Evelyn Graves, Micha Hamilton, Julien Hryshko, Al Johnson, Angela Kariotis, Sue Karnet, George Kopp, Abby Levine, Julie Levine, Beatrice Mady, Alan McCormick, Larry McKim, Mansa Mussa, Nancy Nikkal, Sam Parr, Melida Rodas, Felix Sockwell, Debra Wade, Joe Walentini, Alan Walker, Michael Weintrob, Gail Winbury and Ann Vollum. Widely believed to have originated at the dawn of the 20th century within the African-American communities of the Southern United States, Jazz music has drawn upon and absorbed the “flavor” of many different national, regional and local cultural influences as it has spread around the world. The timely and timeless pulse of music is rooted in the polyrhythms and syncopation of the heartbeat, but it is the use of improvisation, experimentation, blue notes and swung notes that fuels Jazz with its distinctive sound and intriguing permutations, forever binding it to the human experience by providing each of us with a sense of ownership and identity. Since the 1920’s, native sons and daughters of The Garden State have been stoking the creative fires of Jazz music and its related art forms. Historical figures like pianist James P. Johnson (of New Brunswick) was a pioneer of the STRIDE style, bandleader/composer/musician Count Basie (of Red Bank) innovated the use of two “split” tenor saxophones, which emphasized the rhythm section, and singer Sarah Vaughan (of Newark), known as “The Divine One”, is widely recognized as having one of the most wondrous voices of the 20th century. Modern figures like multi-instrumentalist/songwriter Al Di Meola (of Jersey City) have been influential in Jazz Fusion and Latin Jazz guitar, John P. Pizzarelli (Jr.) (of Paterson) is recognized for his swinging interpretations of jazz standards, and bandleader/drummer Max Weinberg (of Newark/South Orange) is widely known for his long career with Bruce Springsteen’s E Street Band, as well as his work in television with comedian Conan O’Brien. The Pierro Gallery is located in the Baird Center at 5 Mead Street in South Orange, NJ. Gallery hours are Wednesday and Thursday 2-7 p.m., Friday and Saturday 2-4 p.m. and by appointment. Visit www.pierrogallery.org for more information, or call 973 378 7754 ext. 3.